Birthdays or any special occasion calls for cake and candles. 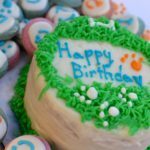 Share this yummy cake with your favorite canine friends.All prices include cake box and decorations. Decorations include frosting, message writing (e.g., Happy Birthday, Happy Adoption, Welcome Home), and perimeter decoration (e.g., grass on the edges).Please contact DEX for any special request.